AIB 365 is a weekly sketch show from India's edgiest, politically incorrect comedy collective AIB. AIB comprises of Tanmay Bhat, Gursimran Khamba, Rohan Joshi, Ashish Shakya. An INTERESTING story about passion to achieve dreams, expectation, Love, SACRIFICE and above all commitment towards ones love… "
This is the novel by Dayal Madan … The is a story of Dev Arora, who has some ambitions and aspirations preset for him, But then mid way of achieving his dreams he fall in love with Visha Kapoor the girl who changed his life completely and then suddenly disappearance leaves him completely neglected. These turn and changes in Dev’s life firstly twirl him aloof from everything and then with self realisation make him millionaire in short span of time. The menacing accident leaves a great impact on Dev life when he become naive about his love life for some time and then one fine day suddenly recalls everything and boost up his life from ashes. The story is about hurt, Love, achieving success, however we can achieve success and money with hard work but not love, commitment and championship that all comes only when you have your beloved by your side in all thick and thin of relationships. The madness of Dec in his love story is a main emphasize of the book. Poems depicting Dev’s love has been written and expressed marvellously. Narration of the story is something which makes you feel reflective many times. The commitment of Dev towards his love is a thing to watch out for in the book. The story is real good example of inspiration to learn and implement, how to achieve success make dreams come true. Dreams of love, career, success and happiness in life. The concept and climax is good, on each and every page it will teach you a lesson. The struggle and achievement of Dev specially in the today’s era where most of the youngsters not much focused is something very inspiring in the current socio-eco-political era have been narrated well. Indeed the story will shake up your emotions to understand the story of Dev. Overall the book is really good and very well expressed; I would like to suggest that a little stringent editing was required as there are some typing errors in the book. The only drawback of the book is the narration of the story has taken place in a management college where ‘Dev’ came to deliver a lecture and share his success story, where as he has also shared his love story and even the some of the delicate moments as well, this is something hard to believe. Also mention of Dev’s professional life takes long time to come in front of the readers. The first half is no different from many other love stories in present times. Overall if asked I would say...this is a good job done by Author… (Dayal Madan) I would give 3 stars to this book. An intresting story about adversities of life, wrongs deed of the people, love and bonding of young GENEREATION. 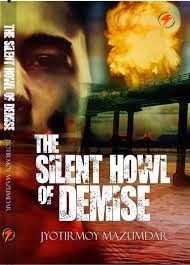 … "
This is the novel by Jyotirmoy Mazumdar … The story revolves around the brutal picture of Guwahati and the raging fire of some anti-national sources. How the peace and harmony of the city is disrupted time and again and how the common people live under a constant fear of terrorists and terrorism. ‘Harsh’ the hero of story and his family due to destiny faces the rage of terrorist activity. The intensity of the subject which is Assam and its terrorism makes the reader to continue till end without giving it a break indeed it is a pleasure to read. The story starts with the news of Rimi's death and the journey of Harsh to seek justice for his sister and the people of Assam. When we face a loss of our loved due to the harsh conditions of other human misdeed that lead to the beginning of revenge in our mind and soul. Harsh, along with his friends, try to find out the truth behind those hideous act of mankind, to find the truth behind the death of his sister, but it wasn’t as passive as they thought it to be. They happen to face the ugly face of reality. Different stories of people who suffer after an effect of terrorist activities is something which will leave you render speechless. Harsh's project against terrorism is the vital theme of the book. Love of Harsh and Piyali is also another important magnetism in the story. Diverse twists and turns in story of various secrets and sacrifices which holds on to readers interest. An abrupt and unexpected end to the story keeps the curiosity of the readers alive. The concept and climax is good, on each and every page it will teach you a lesson. The struggle and achievement of a young generation and their significance in the current socio-eco-political era have been narrated well. The topic covered in the book is really critical and crucial as well; indeed this story will quake you, whip up your emotions and make you feeling the strong urge of going out there and do something for our fellow innocent human beings. You need to go through the book to understand the intensity of story. Overall the book is really good and very well expressed; I would like to suggest that a little stringent editing was required as there are some typing errors in the book. The only drawback of the book is the too much explanation of Piyali’s story and the love chemistry between Harsh & Piyali. It could have been better if it was cut short. Overall if asked I would say...this is a good job done by Author… (Jyotirmoy Mazumdar) I would give 3.5 stars to this book. A thought to share...“At times in life when we love someone unconditionally..., we have to bear every tear...; every heart breaking moment and every pain... So that in the end..., it's not just how you love but how much you embrace on. An INTERESTING story about friendship, bonding, SOCIAL economic pressures in life of present young GENEREATION. 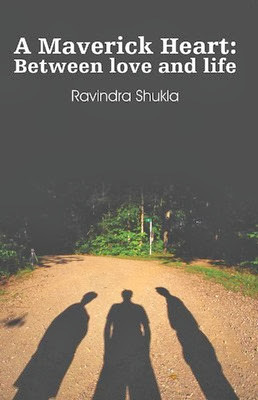 … "
This is the novel by Ravinder Shukla … The story is about depict how we all phase difference of opinion in our relationships on different levels. However, if we happen to meet someone with for whom we feel our frequencies, wavelengths matches and we gel well. This is the story about young kids, with different family backgrounds as their outlook match during their graduation days at IIT-Bombay campus and they become close friends. Though, it seems they are in sync, but when it comes to their interaction with the world it’s different. We find love, sacrifice, emotions, and politics. All were beautifully defined. There were so many characters that readers will get confused but Ravinder had nicely defined each character that we can easily recognize them without getting confused. The Three main characters Rahul, Richita and neerav were very interesting to read. They have different backgrounds but destiny made them together and till the end they were attached with each other emotionally and physically. The Romance between Richita and Rahul during IIT days were very beautifully defined. It was passionate and mature. And their sacrifice for each other was commendable. Deepak as a husband was also nice to read. I personally liked Richita’s character. It was intense, love, sacrifice that she faced during whole life was appreciable. The reaction of Richita to Rahul’s last letter was interesting. Even when She had to confront Deepak for divorce was also interesting. I also loved to read Neerav and Richita’s interaction during some session was interesting. The best part of the book was some wisdom words which were mentioned in the book. The climax was good and interesting. The concept and climax is good, on each and every page it will teach you a lesson. The struggle and achievement of a young generation and their significance in the current socio-eco-political era have been narrated well. Mention of too much politics is something which makes reader to lose interest and story become boring. Overall the book is really good and very well expressed; I would like to suggest that a little stringent editing was required as there are some typing errors in the book. Also would like to mention that few chapters can be removed, like the long description of college completion, politics and other things would have made it much better. Overall if asked I would say...this is a good job done by Author… (Ravinder Shukla) I would give 3 stars to this book. An INTERESTING and inspirational story the turmoil of an Underrated Love and an Overrated Infatuation. 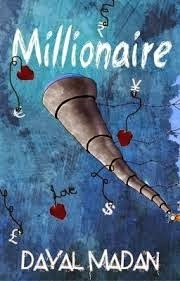 … "
This is the novel by Mansi Sharma & Sankalp Kohli … The story is about the turmoil emotions, emotion of an underrated Love and an overrated Infatuation. This is story of ‘Raj’, a young guy with the dreams larger than life, from a small town of Kanpur, He faces different up and down of life, where his path leads to nowhere but only to a dead-end. Through the exhausting period of life and different circumstances, he decides to part his ways with Mahek. But then he fails to justify his decision to himself, his friends and to Mehak. He realizes the importance of importance of Mahek in his life, only when she moves out of his life completely. The guilt of not been forgiven by her, ruins his soul; and that frustration leads him into seclusion, devoid of even his best buddies Rohan and Rahul. The way the old couple tried to tell Raj that one should never lose hope. After every bad phase there will be a ray of hope. Mahek, Rahul and Rohan were also nicely defined. Raj reaches to the point where he is left with failed love, broken friendship, a hurt ego and lost soul he was doomed to darkness. With no of hope future ahead, and then just when Raj was about to give up on life, he comes across a note, written to him by his favorite professor, "Never give up Raj Because Every Raindrop is a Hope" which brings Raj face to face with his own self. 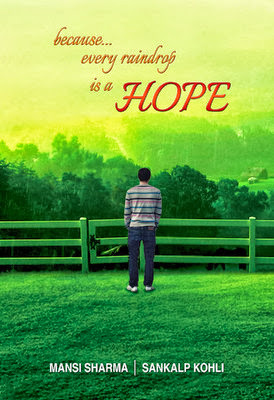 This is a novel by Mansi Sharma & Sankalp Kohli … “ Every Raindrop is a hope” is a very inspirational title The concept and climax is good, on each and every page it will teach you a lesson. It’s true Ego can ruin your relation whether love or friendship that is what happened to Raj. This story give you a moral, that Life is a blissful journey with up and down and one should never lose hope. God is there and he will always help you to fight back. Overall the book is really good and very well expressed; I would like to suggest that a little stringent editing was required as there are some typing errors in the book. Also would like to mention that few chapters can be removed, like the long description of college completion and other things would have made it much better. Overall if asked I would say...this is a good job done by Author… (Mansi Sharma & Sankalp Kohli) I would give 3 stars to this book. "इस दुनिया की भीड़ में चले थे खुदमुख्तार हो कर हम ऐ रकीब...,तमाम शहर ख़ाक छानी.., श्याम हुई तो आपनी ही कब्र में आकर बस गए..."
Dear friend's....I would like to take this opportunity to thank Mr. Rahul Miglani﻿ who was magnanimous in his outlook and gave me (still a budding blogger) chance to be interviewed by the Blogger’s post. Grateful to you Sir. 1. Can you tell us a little about yourself? Your blog, and your aspirations and your hobbies!! I’m an IT Professional and have been categorised as a Trainer, and do have adequate experience as a trainer. Besides my work I am very passionate about music and reading. It won’t be wrong to state that I love writing. I work for an IT software making company. Apart from writing, I have been working from 2003 onwards, ever since a cruel twist of destiny took my near and dear ones away forever. As far as my aspirations go, one day I want to prove to the world I am not only a good blogger but a sellable writer. 2. How did you first get involved in with blogging, are you an imaginative person? I don’t even remember how it started. It’s just that one day an old friend provoked me to scribe down my ideas and thoughts. Slowly from one topic to another I kept adding from my college days onwards. The twist of destiny did give my blog post the required depth. If I have to rate myself on a scale of 1-10, then I can rate myself at 7 or 8 as an imaginative person. Getting time; professional and personal commitments don’t give adequate freedom to write. Priyanka Dey, Shilpi Dutta, Shivani Goyal, Shwetabh Mathur, Geetanjali Kaul, Neeraj Bhushan, Nimmi and many others. At present I’m working on a book. Most of my personal views and experiences do get reflected in my writing. However I am careful not to give a personal touch on subjects that do not require the same. I do give opinion about books I have read, and also cover general social or lifestyle issues. A thought to share..."Often I wonder how some people walk into our lives..., embark their charisma on our hearts...; and we are never the same...until we get a chance to relive those moments again..."